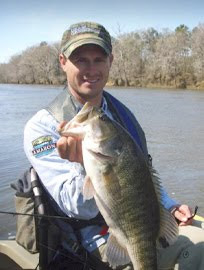 I first read about shoal bass in the posts of Drew Gregory on RiverBassin.com and other forums. He described the fish as "smallmouths with bigger mouths" as well as potentially larger bodies. Guys like Jon Freeman and Sean 'Bruiser' Brodie have shoalie fishing down to a science and their stories about shoalies always have me on the edge of my seat. I always think - gosh, one of the most aggressive bass species with a big mouth and potential to grow to nearly 9 lbs...yikes! I just had to catch one and on my trip to Georgia this past weekend...and thankfully I made it happen! This dude (Drew Gregory) has caught some big shoalies! I mentioned in my blog yesterday, our goal when we made it to GA on Friday was to scout a few rivers. After that, we had planned to go catch a shoalie. Unfortunatley, it took us all day to find a spot we wanted to fish. At our very last stop Bill landed a fish that looked like a shoalie, but not quite. It had a lateral line, but also a tongue patch. Was it a shoalie, a spollie, spargemouth (ok that was a reach) or something else. It turns out, a lot is still not known about the shoal bass and a lot of hybridization is taking place with other species. In all likelihood, I think it was a spot hybrid of some sort. About 10 minutes later my crankbait got creamed coming through an eddy. I knew from the way the fish was shaking it's head that it was a big gal. She ran across the pool and jumped, exposing her back. Right away I knew she was in the 5-6 lb range and my blood was pumping. I could tell from the color of her back and markings that she was not a spot or a largemouth. She came to the surface again briefly and with another massive head shake she threw the hook. That fish is one that will haunt me for a while and is one that convinced me to buy a hook sharpener. Could it have been that my very first shoalie experience was with a giant? The next day I was very optimistic, but also a little worried. I mean, how often do you catch (or in this case almost catch) a giant fish and then catch another giant the next day. Well, my first fish was no giant, but he was a shoal bass or at least a hybrid of some sort. The 14" fish nailed my R&S Baits Chatterbuzz. He fought like crazy and eventually came to hand. I noticed he had very sharp teeth and beautiful colors. My next fish was only about 9" and hit a crankbait. I got him out of the water, but he flopped off the hook before I could grab him. I didn't really care at the time because I knew it wasn't big enough to help my tournament limit, but suddenly I found myself thinking - what the heck was that? Bill was thinking the same thing. It looked like a smallmouth, a rare species for central GA. Whether it was a smallie, shoalie, redeye, or some sort of hybrid I will never know, but man, those central GA rivers must be a nightmare (or maybe a thrill) for fisheries biologists! I then went on to land a lot of spotted bass, until finally pulling the 19" brute that I spoke of yesterday. The fish probably only weighed about 3 lbs, but she was gorgeous and had been eating pretty well. Again, I am not 100% sure if she was a hybrid or straight shoalie, but she was beautiful and she made my day, week, and month! 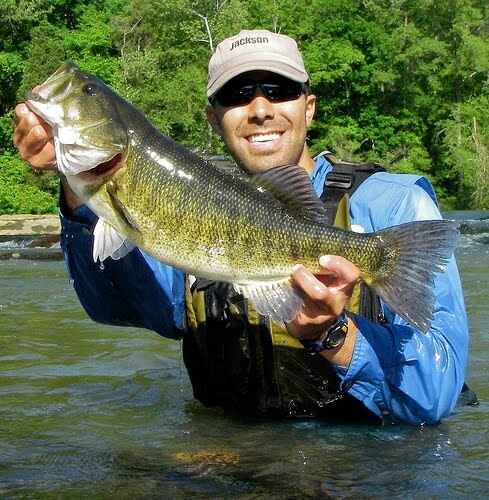 If you love bass fishing and river fishing, like I do, then I recommend taking a week and fishing the gorgeous rivers of GA. I know I wish I would have had more time to spend down there exploring, paddling, and chasing monster shoal bass. Until next time, tight lines! Excellent post Drew and thanks for the mention.The shoal bass is truely a unique and beautiful fish and even more special that it is only found in a few rivers in the south. Thanks Jon and no problem. Hopefully we can chase down some shoalies some time!